Sydney Shop Girl: Glebe. 'My Salinger Year'. A Report From My Kitchen. Glebe. 'My Salinger Year'. A Report From My Kitchen. The whole aim of summer weekends, as far as I can tell, is to spend as much of them outdoors as possible. And the earlier you can start out on the Saturday morning, the better. There's the benefit of a touch of coolness to the air and a bit of shade to go with the morning sun. We crossed the ANZAC Bridge to take a walk around Glebe as tourists in our own city. Bicentennial Park at the end of Glebe Point Road offers a stunning view over Rozelle Bay. How can it be this tranquil so close to the city? It wasn't the time for trying to answer to that but rather to just walk and soak up the peaceful and restorative energy that seemed to waft off the water and settle in the shade of the trees that were everywhere - waterside, at the parks and along the streets of beautifully restored terraces and glamorous new high rises. Glimpses of old technology central to the dockyard past of the bay still stand tall on the water's edge, a striking landmark for the weekend runners and dog walkers getting in their morning exercise. The ANZAC Bridge and the beginnings of the city skyline provide a link with the present as you walk down the streets lined with regal 19th century houses and art deco apartment blocks. But modern times call for modern comforts and Glebe Point Road was buzzing with cafes open for Saturday morning coffees and brunch. We stopped in at Il Cortile, a beautiful Italian cafe that does rich, strong coffees and are also famous for their pastries. Another great Cotton On Kids T on Toddler SSG. Toddler SSG and I didn't have room for pastries but we did enjoy our coffees in the cheerfully decorated area behind the main counter. It felt like we were sitting in a sunlit piazza in Italy and it was a challenge pulling ourselves back to inner city Sydney and the need to get a move on before the traffic got too crazy. By the afternoon, any pretence of good manners were abandoned on account of the heat. Icy cold soda water was drunk straight from the bottle in the cool shade of the front verandah. And it made perfect sense to pad around in bare feet to make most of the coolness of ground damp from the careful watering of pot plants. Siesta time rolled around and while Toddler SSG slept, I made significant progress with last month's photos for our Project Life scrap book. Washi tape and scrapbooking were just made for each other. And then (dessert for) afternoon tea and a good book lured me to the sofa under the airconditioner. If you've been following my Weeknight Book Club posts, you might recall that I haven't had the greatest luck recently with new books on my Kindle. I've hit one of those rough patches where books I've downloaded on the strength of great reviews and my personal love of the author haven't guaranteed an unputdownable read. With the price of some downloads being practically the same as if I'd purchased hard copies, I've tried to finish every book I've downloaded rather than abandoning them after the second chapter. Fortunately, my luck has turned and I've got nothing but praise and passion for 'My Salinger Year' by Joanna Rakoff. If you haven't already read this book, you are in for a treat. It would be a perfect choice for the Australia Day long weekend. I had trouble putting this down since starting it Thursday night. So yes, I made the most of every long afternoon nap the weekend afforded me. Thoughtfully elegant writing, the irresistible pull of its New York City setting and the reflections of a seemingly liberated, intelligent woman of the nineties who still managed to be controlled in a variety of ways by the men in her life. I'll admit right here that I haven't read nearly as much Salinger as I should have but my lack of knowledge of his work was no barrier to my appreciating his skill and his influence on American culture. Rakoff references his work in such a way that ingnoramuses like myself have enough clues in her prose with regard to what a particular Salinger work was about. 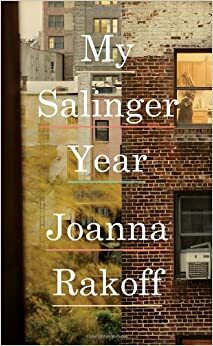 'My Salinger Year' is Rakoff's memoir of her time as an assistant to an agent at 'The Agency' which represented such authors as JD Salinger and Judy Blume. 'The Agency' is stuck in a time of carbon copies, type writers, index cards in a world where the printed word was everything. The internet was treated with suspicion and the arrival of a photocopier and a single computer terminal to the office were revolutionary in their impact on the way 'The Agency' functioned. As the title suggests, much of Rakoff's work revolved around 'Jerry' Salinger - his image, his loud telephone calls and the need to protect him from his fans who thought up ingenious ways of trying to get their letters and requests to him. There was a standard form letter Rakoff was meant to send letter writers but something inside her made her deviate from the script and personally reply to some fans, with unsurprisingly negative outcomes. The New York City of 'My Salinger Year' is that of the late nighties, the social milieu that of young university graduates trying to make it in the competitive world of editing and publishing where maybe, just maybe, these young graduates could one day have their own work published rather than having to subsist on the meagre wages of an assistant for the rest of their lives. It is not the glamorous life of Manhattan but rather that of those struggling to make ends meet in the neighbourhoods of Brooklyn where the edginess is attractive to artists who rail against normality until some grow older (and possibly a little less idealistic) and change their expectations of life and ironically aspire to the life of suburbia they rebelled against as teenagers. But the subplot that kept me turning the pages related to Joanna herself. Would she really stay on with Don, the boyfriend who thought nothing of making her pay all the rent on her meagre wage because she had a 'better credit rating'? Who glibly accepted the rental of a freezing cottage without heating or a kitchen sink? Who openly ogled and critiqued other women in front of her? His conflicted life as a fighter and rejected author gave him an irresistible allure to Joanna. So irresistible that she broke up with her solid and reliable college boyfriend to take up with Don. Why is it so easy for others to see how bad relationships for us? Why do we choose not to listen when strangers advise that 'your boyfriend really should be taking better care of you' when called to your cottage after it nearly exploded because of faulty heating? Some questions are too big for a Monday. I won't say anymore except that there is an epilogue to 'The Salinger Years' that is set a good ten years after the New York City year took place. Before I go, a few updates from the kitchen. Firstly, Instagram was asking about this home made Tom Yum soup. The answer is this jar. It was recommended to me by a Thai friend. All you need to do is make the soup as instructed on the jar and simmer your desired vegetables and meats in it. I added some kaffir lime leaves, ginger and lemon grass for added flavour. I served it with pre cooked vermicelli. And I still hate my Bundt tin. The one that I used to bake the Lemon Yoghurt Cake from last week. I had another go at the recipe this weekend and followed the recipe exactly. It's a hand mixed affair which is very easy to follow. It also tastes fabulous but unfortunately doesn't look as much when I bake it in a Bundt tin. I wonder what I'm doing wrong? I can never get a cake to depan perfectly with this tin. It's a question for Google, I think. I am reading "The husband's secret" by Liane Moriarty. Luffed "big little lies" and binge-read it. I recently made my own Tzatziki in the thermomix. I added more garlic than strictly necessary (ie atomic levels). That cake looks good. I think I might make some peanut butter cookies I tried and loved. Will share recipe if it works good. Oh we were on Glebe Point Rd on Saturday too! You were smart to go early. We were there in the afternoon and it was SO hot! A totally inane sounding question: Do you buy the Sunny Queen Farms eggs because they're stamped with a smiley face? Re the Bundt tin you've probably tried this, but if not try greasing and flouring the tin. Don't be afraid to use a heavy hand with both even if the recipe doesn't call for it. Good luck!